Magnesium is the second most abundant cation in the body after potassium. It is chiefly distributed in bone and muscle and a very small amount is present in circulation. It is essential for calcium metabolism and energy production and maintains electrical neutrality in cells. Magnesium deficiency can result in arrhythmias and nervous irritability. We report an adolescent girl who developed first degree heart block with multifocal atrial ectopics due to hypomagnesemia. A 12-year-old adolescent girl presented with history of sudden onset of loss of consciousness (LOC) while walking to school one morning. The LOC lasted for a minute with no memory for the event and was not associated with abnormal movements of limbs, deviation of eyes, abnormal posturing, or loss of bowel or bladder control. She complained of headache during recovery. Past, medication, and family history were unremarkable. On examination; her heart rate was 119/minute, regular in rhythm, and normal in volume and character. Respiratory rate was 20/min and blood pressure was 100/70 mm Hg with no postural drop. Her anthropometry revealed her weight and height to be on the tenth centile on World Health Organization (WHO) growth charts. General examination was unremarkable. Cardiovascular system examination as well as rest of the systemic examination was essentially normal. 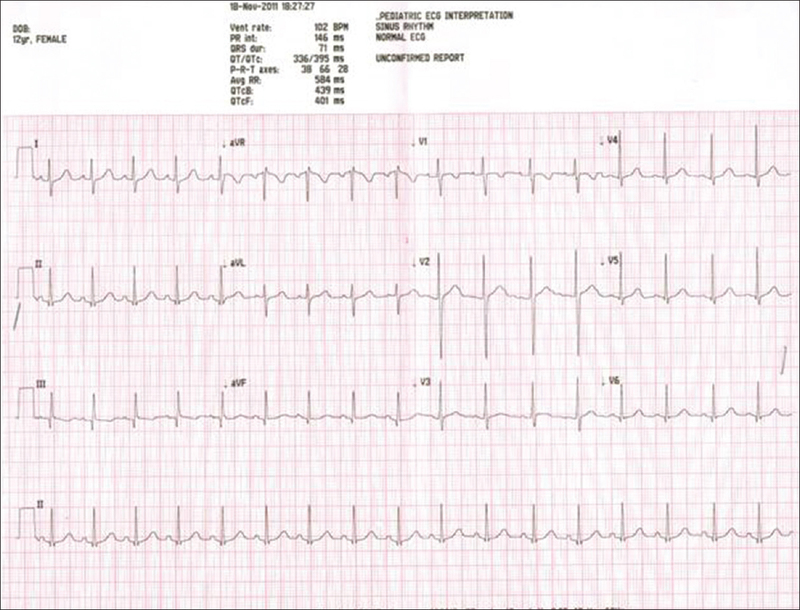 An electrocardiopgram (ECG) was obtained in view of resting tachycardia which revealed abnormal P-wave morphology and increased PR interval (220 ms) in most chest leads [Figure 1]. Biochemical investigations were all normal except for a low serum magnesium level of 0.9 mg/dl (normal value: 1.5-2.5 mg/dl). Fractional magnesium excretion was 0.9% (>2% indicates renal magnesium wasting) and urinary calcium/creatinine ratio was 0.12 (normal < 0.2). The acid-base status, chest X-ray, and echocardiography were all normal. With the above findings, a diagnosis of syncope due to first degree heart block as a result of hypomagnesemia was considered. A 24 h holter recording was also obtained which showed a run of multifocal atrial ectopics with a maximum heart rate of 160/min. The child was treated with intramuscular magnesium sulfate injections at a dose of 25 mg/kg/day for 3 consecutive days. Following treatment, serum magnesium increased to 2 mg/dl and ECG changes normalized [Figure 2]. The child was discharged home with advice to take oral magnesium supplementation and foods rich in minerals. Serum magnesium levels and ECG were obtained at 2 weeks follow-up and were found to be within normal limits with no further syncopal attacks. In our case, the girl had prolonged PR interval on ECG which was suggestive of first degree heart block along and there was prompt resolution of symptoms and ECG changes soon after the correction of hypomagnesemia. Although prolonged PR interval is generally considered benign, an increased risk of atrial fibrillation, pacemaker implantation, and death was seen in a follow-up study of 7,575 individuals mostly adults with first degree AV block in the Framingham heart study. The cause of hypomagnesemia is attributed to dietary deficiency as she was undernourished and her food intake was largely devoid of nuts, legumes, and green leafy vegetables which are rich sources of magnesium. The normal dietary requirement of magnesium ranges from 65 mg/day for infants and young children up to 3 years of age, 110 mg/day for children between 4 and 8 years of age, and 350 mg/day for children older than 8 years of age. There was no history of laxative or diuretic abuse in the girl and renal parameters were normal. Renal magnesium wasting and familial hypomagnesemic hypercalciuria were ruled out by appropriate tests. The finding of normal potassium levels and the absence of metabolic alkalosis makes the possibility of Gitelman syndrome unlikely in the child. Dietary deficiencies are common among adolescent girls and one should actively seek to find and treat them even in asymptomatic individuals to promote a healthy living. Hypomagnesemia can lead to syncope due to arrhythmias and so evaluation of a child with syncope should also include screening for mineral deficiencies. Prompt recognition and treatment of hypomagnesemia results in rapid reversal of symptoms and may even reduce fatality in life threatening arrhythmias. The authors would like to acknowledge Dr. Chhavi, Professor D. Gunasekaran and Professor S. Srinivasan for their inputs on the manuscript. 1. El-Sherif N, Turitto G. Electrolyte disorders and arrythmogenesis. Cardiol J 2011;18:233-45. 2. Christiansen EH, Frost L, Andreasen F, Mortensen P, Thomsen PE, Petersen AK. Dose related cardiac electrophysiologic effects of intravenous magnesium. A double blind placebo controlled dose response study in patients with paroxysmal supraventricular tachycardia. Europace 2000;2:320-6. 3. Ho KM. Intravenous magnesium for cardiac arrhythmias: Jack of all trades. Magnes Res 2008;21:65-8. 4. Iseri LT, Allen BJ, Ginkel ML, Brodsky MA. Ionic biology and ionic medicine in cardiac arrhythmias with particular reference to magnesium. Am Heart J 1992;123:1404-9. 5. DiCarlo LA Jr, Morady F, de Buitlier M, Krol RB, Schurig L, Annesley TM. Effects of magnesium sulphate on cardiac conduction and refractoriness in humans. 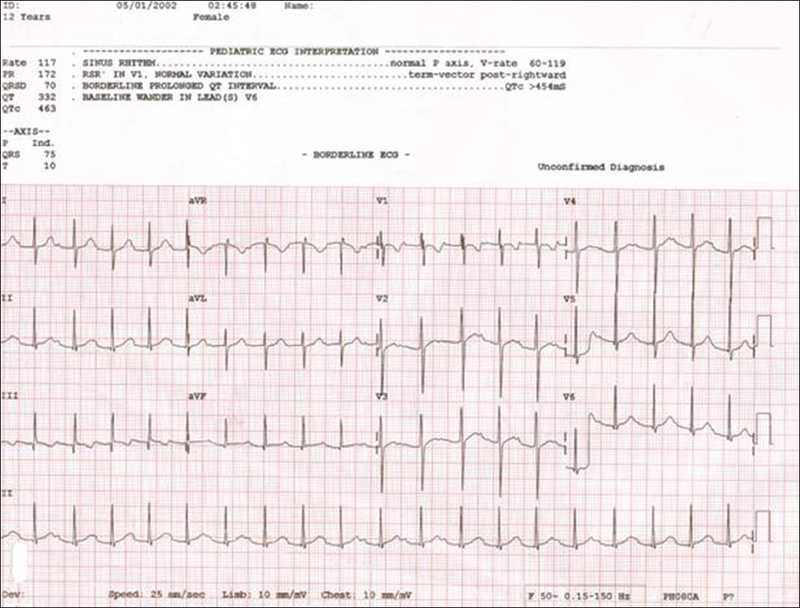 J Am Coll Cardiol 1986;7:1356-62. 6. Rasmussen HS, Larsen OG, Meier K, Larsen J. Hemodynamic effects of intravenously administered magnesium on patients with ischemic heart disease. Clin Cardiol 1988;11:824-8. 7. Viskin S, Belhassen B, Sheps D, Laniado S. Clinical and electrophysiological effects of magnesium sulphate on paroxysmal supraventricular tachycardia and comparison with adenosine triphosphate. Am J Cardiol 1992;70:879-85. 8. Cheng S, Keyes MJ, Larson MG, McCabe EL, Newton-Cheh C, Levy D, et al. Long term outcomes in individuals with prolonged PR interval or first-degree atrioventricular block. JAMA 2009;301:2571-7. 9. Guerrera MP, Volpe SL, Mao JJ. Therapeutic uses of magnesium. Am Fam Physician 2009;80:157-62. 10. Food and Nutrition Board, Institute of Medicine. Dietary reference intakes for Calcium, Phosphorus, Magnesium, Vitamin D and Fluoride. Washington, DC: National Academy Press; 1997.